Make your traffic is highly qualified - To make sure you maximize your chances at increasing website revenue, you need to make sure the traffic you drive into the sales funnel is highly qualified. Whether you do this with a focused PPC campaign or generate high quality organic traffic, ensuring your traffic has the highest quality will drive more people deeper into the sales cycle. Provide a compelling landing page - Once people find your website, you need a place for them to land. Your landing page needs to offer a focused message that entices your visitor to learn more. Trying to pack too much information on a single page will turn visitors away instead of attracting them. If you are using PPC or another paid traffic generation, link your ads with your landing pages in a cohesive message. Provide incentives to entice a visitor into becoming a lead - On your landing page, offer an incentive that will tempt the visitor into providing their contact information. Incentives can take many forms. You can offer a white paper or report. You can offer access to a webinar or an online course. These incentives often push people into providing their name and email address. Create a lead nurturing plan - What are you going to do once you have a lead? You need a detailed lead nurturing plan in place before you get that first precious lead. Your plan should include sending an immediate thank you for their information and sending them a link to the incentive. After that, you can periodically send out email and offer other incentives to continue the nurturing process. Automate your nurturing where possible - You can use auto messaging services and auto responders to make your job as easy as possible. You can set up multiple responses based on any criteria you want to set. This will help you focus your marketing on the individual's first interest. Watch all of your automation for effectiveness and make adjustments as needed. Offer discounts, packages, and other incentives to help reluctant leads convert - As you get further from the time when someone offers their contact information, you will need to up the stakes for that lead. Offer discounts and package deals. Offer higher quality incentives. Give them more value so they make the investment and become a paying customer. When a lead converts, send instant thanks - This instills good will and promotes the chances of future referrals. And that is a chance at future website revenue. 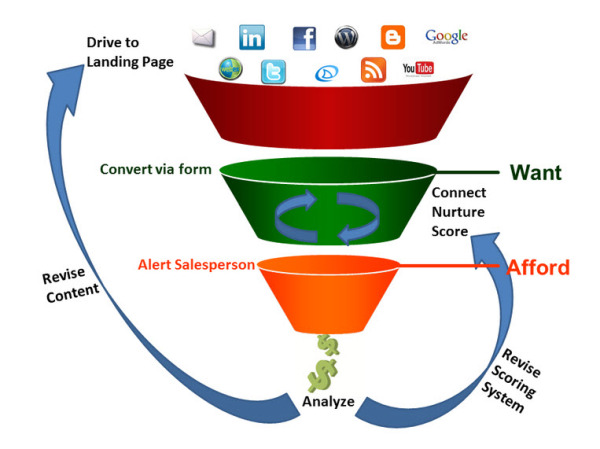 These steps will help focus your web traffic conversion efforts. Filtering out as much low-quality traffic as early as possible will yield lower costs for conversion. A focused landing page with incentives will help a visitor become a lead. Nurturing a lead requires a plan and automation where it makes sense. Create good will with instant thanks for a new paying customer. You can increase website revenue with these simple steps.